DARJEELING: The situation in Darjeeling remained tensed as the agitation for a separate Gorkhaland entered its 20th day today. Internet services remained suspended for the 17th consecutive day as the Darjeeling district extended the ban on it in the hills for eight more days yesterday. Except pharmacies all the other shops, restaurants, hotels, schools and colleges remained closed. 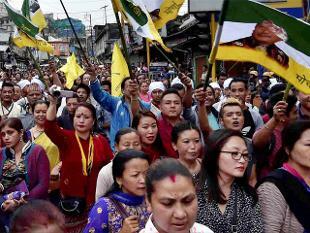 The Gorkha Janmukti Morcha (GJM) is scheduled to take out rallies in various parts of the hills during the day in support of its demand for a separate Gorkhaland. GJM has demanded that the Centre initiate a dialogue on Gorkhaland as it is the aspiration of the hill people. Its general secretary Roshan Giri said yesterday, "The Mamata Banerjee government is dealing with it as a law and order problem. But it is not a law and order problem. It is a political problem and should be solved politically." Various boarding schools have extended their vacation due to the ongoing unrest in the hills. The hills have been on the boil since June 8 following the agitation spearheaded by the GJM demanding Gorkhaland. The agitation has also led to widespread violence, claiming two lives. The situation in Darjeeling remained tensed as the agitation for a separate Gorkhaland entered its 20th day today. Internet services remained suspended for the 17th consecutive day as the Darjeeling district extended the ban on it in the hills for eight more days yesterday.